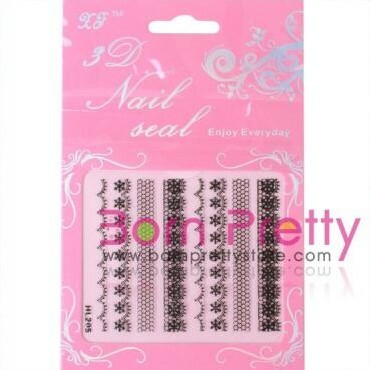 Nail stickers are convenient when you're in a rush but still want some nail art for your nails. Or if you have gel nails you can use these stickers for weeks. Base color is OPI's "Don't Pretzel My Buttons"
These were super easy to apply. I just cut the lace sticker with scissors and applied it to my nails after my base color had DRIED COMPLETELY then finished it off applying my top coat over it all. Here is what the packaging looks like and all the other patterns that come with it. Click here to purchase these stickers and make sure to use my code GYL91 for 10% off and free worldwide shipping! I'm usually not a lace fan, but that is super cute!